Tostones de Pana (Breadfruit Chips) - Tienditadepuertorico.com - Buy Puertorican Food Here!! 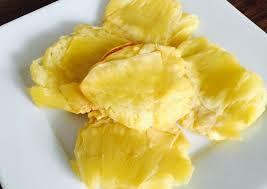 Fry breadfruit slices until tender on the inside and golden on both sides. Working quickly but carefully, return to oil. Fry until crispy and light golden brown. Place on paper towel lined plate to soak excess oil. Sprinkle with salt and garlic powder.